What a charming read-aloud picture book for preschoolers and kindergarten children! The author recreates a special day in the life of a three-year-old which reveals how important it is for parents and extended family to create a loving environment for young children. This book is bilingual and can be used as an aid for learning English and Spanish. 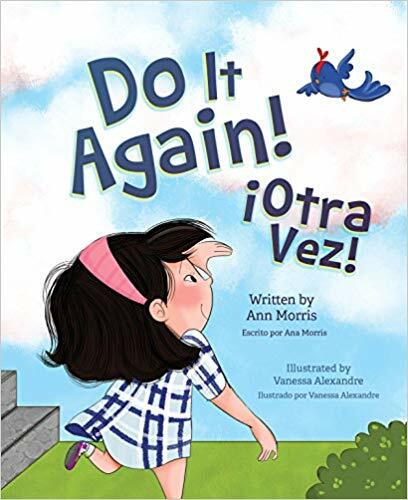 How many times have you heard a young child say, “do it again?” In this story, Amy is a three-year-old who visits her Auntie Ann and Uncle Dale. They bring her on a car ride to a football game where her cousin Mike is playing in the band. The family laugh and plays all day. Uncle Dale throws Amy up in the air and makes her giggle when he speaks like Donald Duck. By the time Auntie Ann tucks Amy into bed, she is exhausted but reassured by the nurturing of her family members. This book contains fantastic illustrations and simple dialogue that will resonate with young children. Perfect choice for a bedtime story, shared sibling read or read aloud book in the classroom. Highly recommended. Thank you so much, Barbara! I always appreciate an honest review, especially when the reader understands why I wrote the book to share with others!